Where did you first play? At Teddington from five to 16. My brother played there too, and my dad helped out. He’s now vice-chairman of the minis. Did you do other sports? I played football and rugby league for Harlequins. Did you play 15s before joining England Sevens? Yes, at London Irish. The AASE scheme (Advanced Apprenticeship in Sporting Excellence) changed me as a player and Giselle Mather there was brilliant. But when I moved up to the senior team it didn’t feel right so I went to Exeter. It was amazing, but England Sevens came along and I couldn’t refuse their offer. How much sevens experience did you have? I hadn’t played until the Junior Commonwealth Games in 2011. I also played for London Irish in the JP Morgan Sevens, but I was pretty new to it still when I joined England Sevens. Adjusting to the workload was hard! Getting my first cap was the pinnacle of my career. My goal now is to establish myself in the team. Why is sevens so good? The excitement! Being able to express yourself on the pitch, with so much space, it’s a great feeling. Jason Robinson and Shane Williams. That’s the type of player I’d like to be. They both have great footwork. RW verdict: A recruit from Ben Ryan’s era, look out for this speedster in the World Sevens Series. 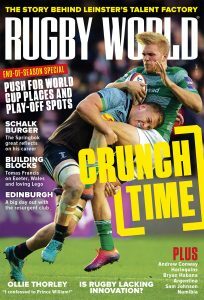 For more news from the IRB World Sevens Series and to keep up to date with all rugby’s up and coming youngsters, subscribe to Rugby World. Click here for the latest deals, or download the digital edition here.